There are several possible ways to fix a tooth gap. The teeth can be moved together with orthodontics, or the teeth can be covered with porcelain veneers, or we can use direct dental bonding to add width to the teeth. For a small single gap, Dr. Thein prefers using direct dental bonding. This can be done in one appointment. 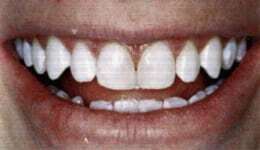 It uses a composite material that is applied to the sides of the teeth to make it appear wider. Dr. Thein will match the shade, translucency, and surface texture of your teeth, and will shape the material to fill in the gap, as shown in the photographs on the right. Read more about dental bonding. Some dentists do not like to use this technique, because it requires artistic ability. But if a dentist knows how to properly shape and polish the composite, bonding works very well. Besides being durable and beautiful, it preserves more natural tooth structure and it is usually the least expensive way to correct the diastema. Dr. Thein possesses the artistic ability to successfully close gaps in teeth. One way that is advertised on the Internet for correcting a tooth gap is with rubber bands to pull the front two teeth together. They are called Teeth Effects bands, and we strongly recommend against them. First of all, they are very risky. They can loosen the front teeth, sometimes so severely that it leads to the loss of these teeth. Second, the results are often less than ideal. The rubber bands, rather than causing the teeth to slide together, cause them to tip together, and they can end up looking uneven and strange. Beware of these methods as they are very enticing due to their extremely low prices. Dr. Robert Thein of Los Angeles uses advanced cosmetic dentistry techniques to fill gapped teeth in a proper manner that leads to desired results. If you have any questions or concerns regarding tooth gaps, then contact our Los Angeles dentist @ 888 679-8118.